De door de UNESCO beschermde kustlijn van de Cinque Terre is de ster van de Italiaanse Rivièra en deze dagtour door Lucca volgept alle hoogtepunten in één dag. Bezoek de dorpen Manarola, Riomaggiore, Monterosso en Vernazza; monster Limoncino likeur; afkoelen met een duik in de zee; en geniet van een heerlijke Ligurische lunch (als de optie is geselecteerd) in een lokaal restaurant. Ontmoet uw gids in het centrum van Lucca op tijd voor een vertrek van 7 uur 's ochtends. Reist u aan boord van een GT-touringcar of minibus met airconditioning, begeeft u zich op een mooie rit langs de Cinque Terre en onderweg stopt u om de door UNESCO beschermde landschappen te bewonderen. De eerste stop is in Manarola, waar je de tijd hebt om de kleurrijke huizen te bewonderen en misschien een paar van de beroemde Sciacchetrà-wijnen van het dorp te proeven (op eigen kosten). Breng een bezoek aan Vernazza, waar hoogtepunten zijn zoals de ruïnes van het middeleeuwse kasteel, caruggi in Genua (rijstroken) en de levendige haven, voordat je doorgaat naar het pittoreske Riomaggiore, de grootste van de kustplaatsen. Aankomst in het historische vissersdorpje Monterosso op tijd voor de lunch (inclusief als optie geselecteerd) en ga naar een restaurant aan de kust om te genieten van traditionele Ligurische gerechten. Sluit het af met een proeverij van de beroemde Limoncino-likeur uit de regio. Na de lunch kunt u genieten van de tijd om zelfstandig te verkennen, de winkels rondsnuffelen voor souvenirs, of een duik nemen in de zee voordat u op de terugreis naar Lucca vertrekt. Je rondreis eindigt rond 7 uur in het centrum van Lucca. Our tour guide was great, a friendly young lady who kept the group together and who ensured that we had transportation back to Lucca at the end of the day. However, Cinque Terre itself was a bit of a disappointment, in that the entire area was overcrowded with tourists. We would not want to return to the area because of this, but if you don't mind crowds, the tour was well organized and well led. The Cinque Terre was beautiful and this tour definitely gave a good overview of the area, but there is room for improvement. I had paid for pickup and dropoff to my b and b. The van was a bit late picking me up in the morning and when the bus dropped us off for the van driver after the tour, he was not there yet. There were 2 of us and we were dropped off in a McDonald's parking lot and left to try to figure out who the van driver was when he got there. We visited 3 of the 5 towns of the Cinque Terre plus Porto Venere. I think they tried to cram too much into one tour, because the whole thing felt rushed. Our guide, Chiara, did her best, but there was just too little time. We stopped for optional lunch in one of the towns, and by the time the meal was over, there was hardly any time to see the town before we had to line up for the boat to Porto Venere. All and all, I felt the tour gave an overview of the towns, but there was really not much discussion of their history, etc., and there was too little time to see the various towns. I feel it would be better to skip one or two of the spots and have a bit more time at each location. I will probably go back on my own and just take the train so I can see the area at my leisure. Maybe we read the information incorrectly but we were under the impression this would be a small group tour from Lucca to the Cinque Terre. We did not appreciate we would meet up with a tour bus of people from other towns in Tuscany Florence and Pisa. The group was too large and it was very impersonal. The guide did an excellent job but the expectation for her to please and track all these people is over-reaching. 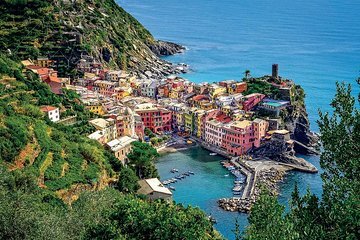 The Cinque Terre is an interesting and special place to visit and we enjoyed the towns visited and had an absolutely wonderful lunch during our free time but I would not recommend this tour to anyone wanting a more personal experience. Many in our group from Lucca eight of us I believe felt the same way. Our guide spoke excellent English but seemed to provide more information in Italian. If you have limited time this is a good way to see the sights of Cinque Terra. The information provided for our pick up in Lucca was very confusing in spite of double checking. The driver was 10mins late and we had to make 2 phone calls to confirm we were in the right spot. We did enjoy the day and the villages are lovely and the view from the boat was a bonus. It was a very beautiful and well organized trip. We took a bus and train to get there. During the summer months you can take a boat! I bet that is stunning. The area is beautiful and the shops had so many trinkets that you will want to take home. They gave history as we drove and as we walked. Its just so pretty once you arrive that you want to just sit and take it all in quietly. This was the most disappointing tour of my entire trip to Italy. First, I was picked up at my hotel late by a man who did not speak to me at all, and spoke to the other people in the car in Italian. He never once attempted to speak to me in English to include me in the conversation - even though he was fluent in English. Then, he drops us off at a rest stop on the side of the highway - again, doesn't speak to me to explain why I am being left there. The other people in the car were nice enough to tell me that a bus would be picking us up. After waiting for 15-20 minutes, a tour bus picked us up. I had booked other tours with Viator and expected a small tour like the others that I'd been on. Obviously with a double-decker bus that wasn't the case. Then we finally arrived in Cinque Terre and only got to spend a short amount of time in each place. I purchased the lunch but by the time we got to the last place I was so frustrated that I wanted to explore on my own so I ditched the lunch. On the way back we were again left at a rest stop, picked up by the same nasty man who again did not speak to me and brought back to my hotel. All in all a very disappointing experience. Tour guide Rafael had a difficult task shepherding a bus load through coach/train/ferry/train trips, but he got everybody back safely! The Cinque Terre tour is excellent, and the boat trips were an unexpected bonus. We enjoyed the day. We visited three of the five cities and used the opportunity to get some of our souvenir shopping done here. We recommend stopping by some of the local food vendors and trying some of the fried calamari. What kept the tour from getting a 5-star review was the lunch. While the food wasn't bad, there wasn't very much of it, and it a little lack luster. We would've rather gone to a restaurant on our own rather than at the one that was struggling to feed the large group in a short amount of time.